As wellness of the mind is key to wellness of the body, we offer a calm sanctuary of classic elegance. Our serene decor and thoughtful amenities relax and prepare you for rejuvenation. We provide guests with premium quality amenities including robe, slippers, private locker, shower, and vanity products. Arrive early for your treatments and linger afterward while you enjoy our women's or men's spa circuit, including steam rooms, signature shower, and whirlpools as well as our relaxation lounges. We also offer guests the conveniences of additional fitness, fine dining, recreation, and hotel options - making it perfect for the ultimate wellness weekend getaway. The 33,000-square-foot facility features signature Inspired Spa Experiences, which include a variety of body and skin-care services using ingredients once favored by the apothecaries. The 17th Century-Inspired Treatment—the Detoxifying Herbal Wrap and Hot Stone Massage—promotes healing using a warm body wrap and heated stones with a full-body massage to encourage deep relaxation. The 21st-Century Advanced Age-Defense Spa Experience blends modern-day technologies with a head-to-toe exfoliation and moisturizing properties to leave skin soft and supple. 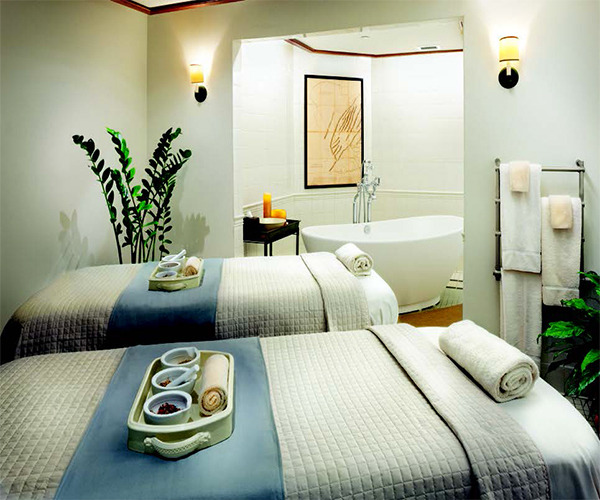 Guests also can enjoy specialized treatments such as the Massage Sampler, which combines a sampling of Swedish, reflexology, sports, hot stones, and aromatherapy modalities, or classic therapies like the Williamsburg Massage. Additionally, spa-goers may book specialized add-on treatments, including a scalp massage or shea butter application, into their service. The spa offers steam rooms, rainfall showers, and whirlpools. A fully equipped fitness center sports cardiovascular equipment, free weights, and group classes, as well as heated indoor and outdoor pools. *Small fees may apply for fitness and pool usage. Guests of the resort are only steps away from Colonial Williamsburg's renowned Historic Area, a 301-acre living history museum. Innovative, interactive programming in the re-created capital of 18th-century Virginia invites you to discover a town at the heart of world-changing events and to explore the everyday lives of people who built a nation. Or, browse the galleries of the Museums of Colonial Williamsburg, which specialize in American folk art and decorative arts in the Colonial Williamsburg collections. Since Williamsburg is at the heart of the Historic Triangle, you'll only be a few miles from where British colonists made their first permanent stand-Jamestown-and where American soldiers won freedom from the crown-Yorktown. Additional recreational opportunities include golf, tennis, lawn bowling, biking, jogging, croquet, and swimming. And, for those who love to shop, the Historic Area and adjacent Merchants Square are within walking distance of any resort hotel. Nearby attractions such as Busch Gardens Europe and Water Country USA offer thrilling rides and entertaining shows. The Resort Collection of Colonial Williamsburg offers a total of 1,051 guest rooms and suites in a range of accommodations. The elegant Williamsburg Inn has hosted royalty, heads of state, and other dignitaries. The adjacent Providence Hall guesthouses are a less formal alternative. Colonial Houses-Historic Lodging allows guests to experience 18th-century accommodations with modern-day amenities right in the Historic Area. The Williamsburg Lodge provides a taste of southern hospitality with furnishings inspired by the collections at the Abby Aldrich Rockefeller Folk Art Museum. The Williamsburg Woodlands Hotel & Suites is a moderately priced modern hotel adjacent to the conference center. For meals, choose from 10 on-site restaurants. Four historic dining taverns offer fare inspired by 18th-century recipes in settings ranging from casual garden dining to 18th-century coffeehouse to a full meal served by costumed waitstaff. At the Williamsburg Inn, dine on culinary classics in the award-winning Regency Room, savor an elegant afternoon tea, or relax with a drink in the Restoration Bar. The Williamsburg Lodge Restaurant serves American cuisine with contemporary southern and Chesapeake influences, or you can enjoy views of the golf courses while dining at the Golden Horseshoe's Gold and Green Clubhouse Grills. The family-friendly Huzzah! features pizza, burgers, sandwiches, and salads.